I tried to do this hair curling technique today and…well, I don’t know. It looked great when I first did it – just like at the end of the video – but took forever to do. The pictures below were taken about six hours later and while my hair was still curled, it was no where near as curly as when I first finished. But enough about hair, let’s talk cream clothing. If you have children, chances are the colors white and cream were banished from your wardrobe long ago. Personally, I’ve always loved cream, but its status as grubby, little hand magnet combined with a deep seeded belief that it adds weight to the wearer, has always scared me off. Still, I decided to give it a try, and to my surprise, I not only managed to stay clean all day, I don’t think it made me look heavier at all. 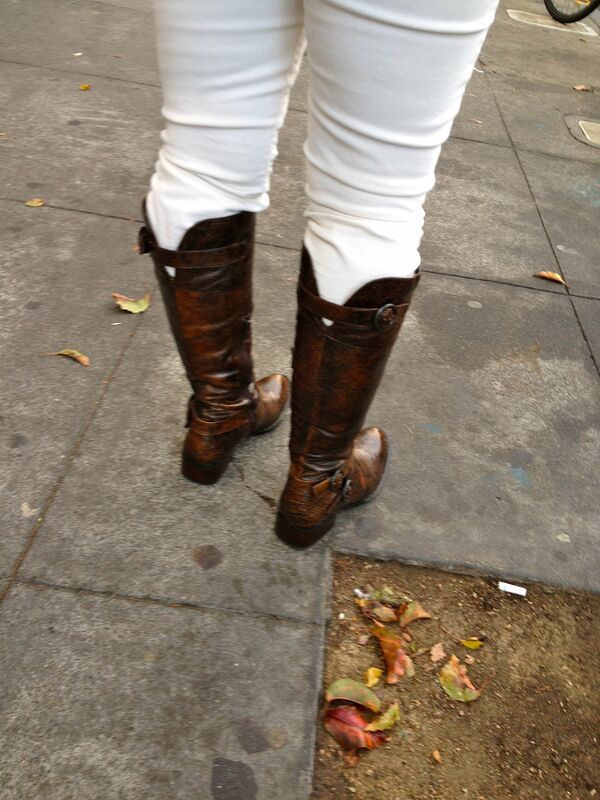 Really, the whole outfit was just an excuse to wear my new riding boots. Every one has splurge items and mine are boots and bags. If I find a good pair of boots, I’ll wear them for years and it’s not unusual for me to have the cobbler replace the soles and heels of my favorite pairs and wear them 7-10 years, if not more. Sometimes, I’ll retire a pair for a few years, and bring them back when fashions change. And fashion always comes back around if you hold onto things. Hanging out on Fillmore Street. I love the cut and buckle on the back of the boots. And the mottled leather isn’t bad either. I don’t normally do a pointy toe, but it works on these. Pants: Skinny fit, fine wale cream cords from Banana Republic. Bonus: They’re petites! 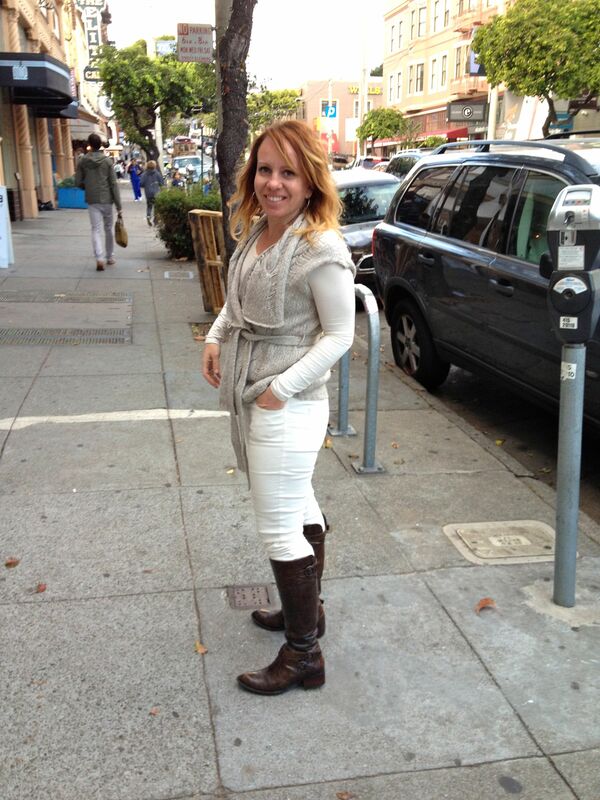 Sweater: Gray and cream cashmere, sleeveless wrap with belt. Bought at Seedstore, a local boutique that I love. 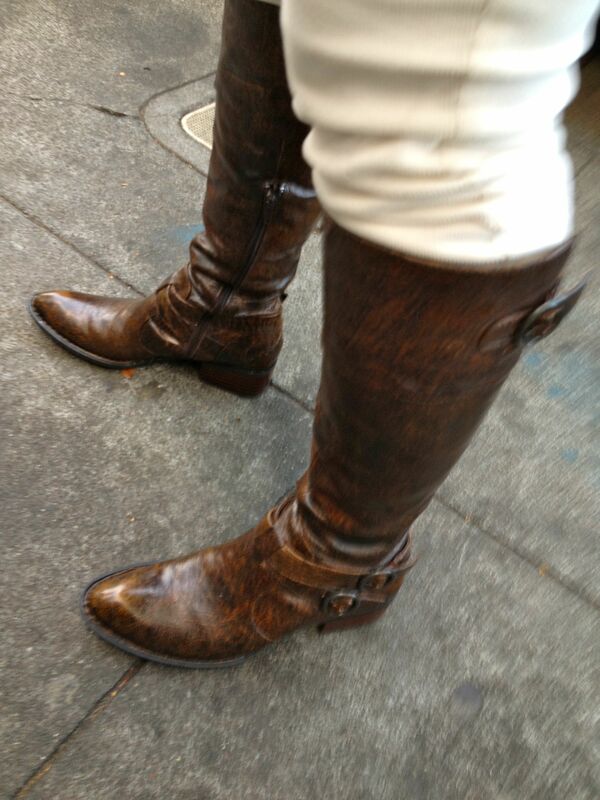 Boots: Born Lira riding boots in Tan Brush off. 8am – Bug and I took the boys on a 5.5 mile hike/run through the Presidio. Our troops remained brave and no one mutinied. Even The Colonel managed the steep inclines with ease. 10:30am – Stopped off for breakfast at Eats on Clement. 11:30am – Home, shower, dress, etc. 1pm – 3:30pm – Dentist appointments for me and all the boys. 6:30 – 10pm – clean, organize, and pack up the garage.